Templates are organized as a zip package or a folder. The file path (without the .zip extension) of the zip package or the path of the folder is considered to be the template name. 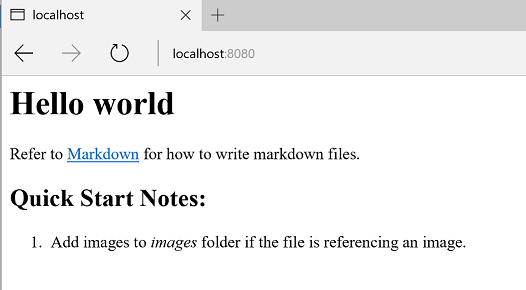 Let's create a template to transform Markdown files into a simple html file. Create a folder for the template, for example, c:/docfx_howto/simple_template. Now a simple custom template is created. 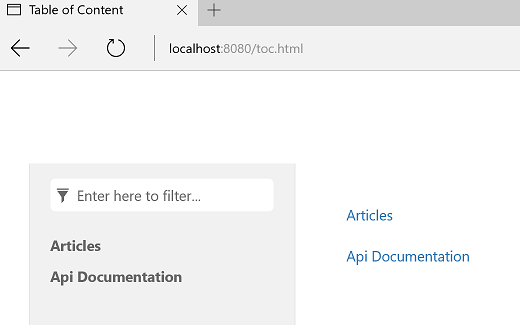 You may notice that DocFX reports a warning message saying that: Warning: [Build Document.Apply Templates]There is no template processing document type(s): Toc. It is because our custom template only specifies how to handle document with type conceptual. To test the output of the template, create a simple documentation project following Walkthrough Part I or download the zipped documentation project directly. In the documentation project, run docfx build docfx.json -t c:/docfx_howto/simple_template --serve. The -t command option specifies the template name(s) used by the current build. Sometimes the input data model is not exactly what Renderer wants, you may want to add some properties to the data model, or modify the data model a little bit before applying the Renderer file. This can be done by creating a Preprocessor file. In the documentation project, run docfx build docfx.json -t c:/docfx_howto/simple_template --serve. Open http://localhost:8080 and you can see _extra_property is added to the web page. DocFX contains some embedded template resources that you can refer to directly. You can use docfx template list to list available templates provided by DocFX. Take default template as an example. Run docfx template export default. It exports what's inside default template into the folder _exported_templates. You can see that there are sets of Preprocessor and Renderer files to deal with different types of documents. DocFX supports specifying multiple templates for a documentation project. That allows you to leverage the default template for handling other types of documents, together with your custom template. When dealing with multiple templates, DocFX merges the files inside these templates. The principle for merging is: if a file name collides then the file in the latter template overwrites the one in the former template. In the documentation project, run docfx build docfx.json -t default,c:/docfx_howto/simple_template --serve. Now the warning message There is no template processing document type(s): Toc disappears because the default template contains Renderer to handle TOC files. Open http://localhost:8080/toc.html and you can see a toc web page. Run docfx template export default to view what's inside the default template. It is possible that DocFX updates its embedded templates when a new version is released. So please make sure to re-export the template if you overwrite or are dependent on it in your custom template. If you want to modify some properties based on DocFX default template's Preprocessor, you can use Preprocessor extension file to achieve this. Compared with modifying ManagedReference.html.primary.js directly, you needn't worry about merging your custom templates with DocFX's embedded templates when DocFX updates. Back to top Copyright © Microsoft.